This Sardonyx crystal pyramid is a stone of protection, strength, attracts friends and good fortune. It can bring happiness and stability to marriage and partnerships. 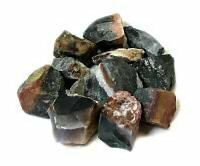 Sardonyx alleviates depression, improves perception and the processing of information. It supplements willpower, increases stamina, vigor and self-control. Sardonyx is most helpful in the healing of bones and lungs, strengthening the immune system and regulates fluids and cell metabolism. The sardonyx crystal is referred to as the Gem of Courage and the Gem of Virtue. A blend of sard and onyx, this stone is found worldwide but the best specimens are mined chiefly in Brazil, India, California and Uruguay. 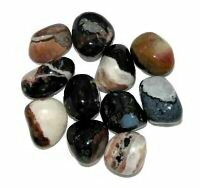 The color bands of sardonyx are white against a black or brownish-red background and it is usually cut into beads or used to fashion cameos. Indeed, the first cameos ever discovered were fashioned from sardonyx. The name derives from the Greek sard and onyx, which means brownish red and white stone. According to legend, sardonyx aids in communication and provides its owner with elegant speech, as well as being a valuable ward against evil. 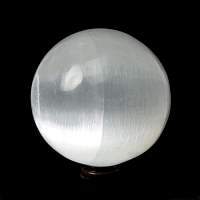 Thought to calm relationships, as well as being credited with the power to attract friends and good fortune, this stone is believed to bring happiness to couples. 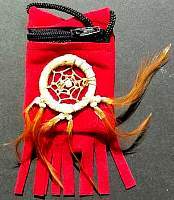 It is also thought to increase regeneration, intuition and instincts. 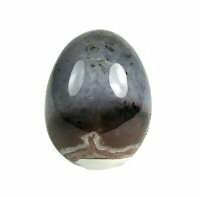 In addition, sardonyx is credited with decreasing sexual desire and promoting a change in bad habits. Sardonyx stone was once considered to be a charm against such assorted afflictions as warts, boils, cramps, the evil eye and the wicked thoughts and impulses of witches, this gemstone was a favorite of the Ancients and used by the Egyptians to carve scarabs and beetles which would be worn as talismans. Exceedingly popular and greatly valued throughout antiquity, the sardonyx was held in high esteem by the Romans who used it as material for carving, particularly in the manufacture of seals since it was said never to stick to wax. Roman legions would carry sardonyx images of Mars, God of War or the valiant Hercules into battle to guard against evil, bring good fortune and hopefully bestow the courage and daring of such heroic figures upon their armies. During the Renaissance, the sardonyx was thought to eloquently bless those public speakers who chose to wear it. Perhaps the most famous sardonyx in history is the one carved with the likeness of Elizabeth I of England and set within a gold band which the Queen then presented as a memento and keepsake to one of her favorite courtiers, the Earl of Essex. 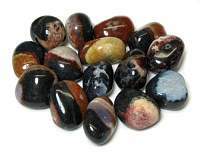 Sometimes referred to in modern times as the fancy wallpaper of nature, the early astrologers believed that sardonyx was a gift bestowed upon the Earth from the planet Saturn...doubtless due to the multi-colored bands which adorn this stone. Sardonyx is useful in the art of mental self control, this gem is traditionally said to aid in the cure of depression and anxiety but is particularly helpful in the easing of grief. 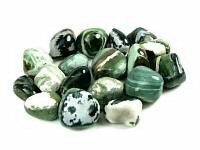 The lucky gem for Leo individuals born in August is the sardonyx. They share this fortunate jewel with those Virgo individuals who were also born during the same month. A pyramid is a great tool for channeling energy and helping to balance that is within and without. The pyramid is a wonderful tool for crystal healing, ritual and magical practice. Pyramids are known to attract and direct energy. 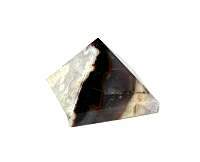 About this page: This Sardonyx crystal pyramid is a stone of protection, strength, attracts friends and good fortune. It can bring happiness and stability to marriage and partnerships. Sardonyx alleviates depression, improves perception and the processing of information.